Finnish goaltender Sinuhe Wallinheimo playing for SM-liiga team JYP Jyväskylä in 2007. In ice hockey, the goaltender is the player responsible for preventing the hockey puck from entering their team's net, thus preventing the opposing team from scoring. 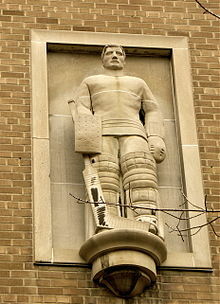 The goaltender usually plays in or near the area in front of the net called the goal crease (often referred to simply as the crease or the net). Goaltenders tend to stay at or beyond the top of the crease to cut down on the angle of shots. In today's age of goaltending there are two common styles, butterfly and hybrid (hybrid is a mix of the traditional stand-up style and butterfly technique). Because of the power of shots, the goaltender wears special equipment designed to protect the body from direct impact. The goalie is one of the most valuable players on the ice, as their performance can greatly change the outcome or score of the game. One-on-one situations, such as breakaways and shootouts, have the tendency to highlight a goaltender's pure skill, or lack thereof. Only one goaltender is allowed to be on the ice for each team at any given time. The goaltender is also known as the goalie, goaler, goalkeeper, net minder, and tender by those involved in the hockey community. In the early days of the sport, the term was spelled with a hyphen as goal-tender. The art of playing the position is called goaltending and there are coaches, usually called the goalie coach who specialize exclusively in working with goaltenders. The variation goalie is typically used for items associated with the position, such as goalie stick and goalie pads. Podcast: Ep #72 "Playoffs Series Recaps, Goaltender Interference, Oshie Injury + More!"